Laphraoig released quit a few expressions recently, some of them better some are ok. 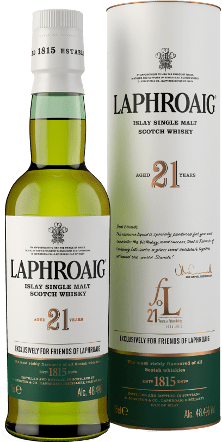 This one being the oldest Laphraoig I can still afford (the 32 year old does sound lovely, but it’s up there and I can not even think of buying it at around € 1200).It is a “limited” edition, released to commemorate the 200th anniversary of the distillery. The liquid was distilled in 1993, and matured in ex-Bourbon casks for 21 years.The expression is only available to Friends of Laphraoig (but anyone who ever bought a bottle, can join the club), and it does seem not to have been a big success sales wise, as it is still available on the site , months after the launch. I guess € 130 / 90 quid are a lot of money for a wee bottle (only 35 cl), even at that age… I’ve been deliberating if to buy this bottle for some time now, and wanted a taster before I shelled out that much money for the bottle. Luckily I was able to taste some last night while enjoying some whisky with good friends (Cheers, Rotem). So how is it? Let’s dive in. Nose: A very gentle nose on this one, It is not a peat monster, but It does feel younger than 21 year old (in a good way, the peat is still kicking! ), There’s the peat, but you also get some fine wood notes (a sour edge maybe) as well as a lovely fruity undertone , quite tropical with candied pineapple, maybe green mango, and papaya too. Very nice ex-bourbon fruity profile indeed. Some vanilla ice cream to complement the fruit, and wood spices too. You get a bit of medicinal notes as well, but quite far away. Palate: A continuation of the nose: fruity with the exotic fruit, sweetness, the peat is quite subdued, but you get the BBQ meat (Israelis would call it : Bisli Grill), and the wood smoke is there, yet balanced. You can certainly get the medicinal / maritime notes as well (wet tar, rope, and iodine), but they mix nicely with the fruit, as not to be prominent. Finish: Love the finish, very long with the sweet smoke, ash, and the sweet barley going a long way. Delicious. This has to be one of the better OB Laphraoigs I’ve had in recent years, it’s not a biting Laphraoig, but a fruitier, creamier, yet still peaty enough as to be recognized as a true Laphroaig. The balance is wonderful. Really a nice change from the current trend of young,super peaty and one faceted drams. One advice for Laphraoig : expensive whiskies in smaller bottles may make it seem more affordable, but we’re love a full bottle of this too. Still available online at the Laphraoig Shop.